Art Show Diego Cibelli performance - How can I become the Ecista of myself? A body is never truly alone, totally independent. It’s relationship with the surrounding elements determines its state. When moving through the urban space in a taxi, your body and the driver’s body share a common state. You are both trying to reach a destination by passing by other possible destinations. The driver possesses more information than you do, he has seen the space you are moving through in its past forms. Try and think of him as an archeologist who guides you. Diego Cibelli is an eclectic artisti who moves with ease from photography to video, from installation to performance, from the language to writing. Cibelli was born in Naples and completed his art studies at Weissensee Kunst och Schule in Berlin. Now he is engaged in a theoretical study on the humanistic geography. Diego Cibelli in 2011. During its display, the exhibition will change its form and will include new works developed locally. 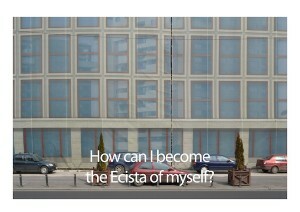 "Diego Cibelli performance - How can I become the Ecista of myself?" Art Show in Bucharest. You can get here description, reviews, address, time and details of "Diego Cibelli performance - How can I become the Ecista of myself?" Art Show in Bucharest. Visit Bucharest Tips for more Art Show events in Bucharest!